Tea Tales – Grab a cuppa, tell a story or listen to one. My love for my cuppa is inherited. A few hours after giving birth to me, my mom had asked the nurse “Can I get a cup of tea please?”. Tea took precedence over any other drink or food or medicine that had been offered to her. And this had gotten the hospital staff worried. How do I know that? I saw this repeating after a major surgery that she had many years later. She refused ice chips, water or jello. All she wanted was a cup of tea. She nagged the staff for a cuppa for hours. And when she was offered one, she sat up on the hospital bed, all set to conquer the world. If I think of my mom, it is a picture that will be incomplete without a cup of tea next to her. If we both had our way, we would be living right in the middle of a tea garden, plucking leaves, steeping and drinking tea and conversing all day. Or maybe she would paint and I would write when we got tired of conversing. Well, that is only if wishes were horses. We begin and end our day with a cup of tea everyday, regardless of where we are. Not just my mother, I have managed to surround myself with people who love their cup of tea and conversation. Even the ones that were once ignorant of this bliss are now party to it. The hint is towards my husband. I can get him to talk more over a cup of tea than a bottle of wine. And he is more particular than the royals about how his cup of tea is steeped. To the extent that it can annoy the tea lover in me. My partner in crime, Soumi, is overly fond of her tea just like me. You should have no doubt on why we named our blog “chatoveracuppa”. We have never chatted in real life without a cuppa. When we meet, we find ourselves asking each other several times over “Cha khabay ?” (Will you have tea?) Bengalis genetically have a weakness for cha (tea) and adda (conversation). We cannot live without both. We make friends with people who love tea. We read about tea. We read food blogs where tea is of much importance. Now take for instance, Bong Mom’s blog, we love it. Her style of storytelling, as if she is conversing with us in person, the simplicity in her recipes and her love for tea. 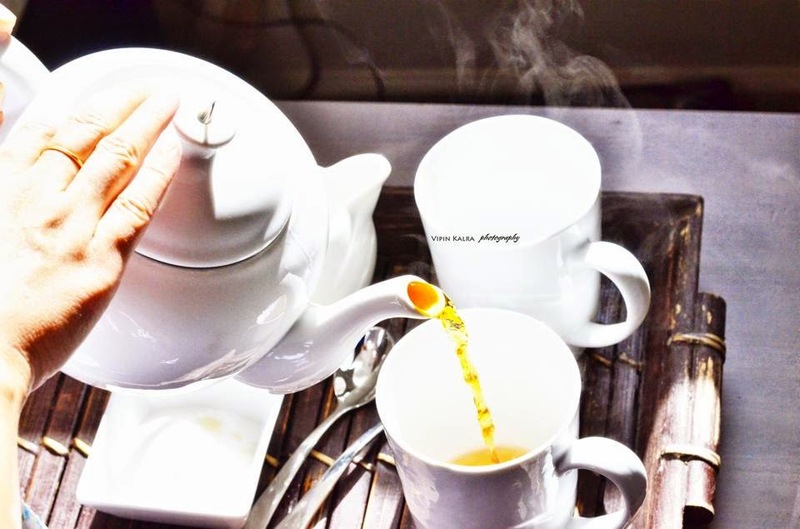 There are often times when she has mentioned tea in her post, that mere mention has prompted us to steep one quickly for ourselves before we read her entire post. It would be a crime otherwise to scroll and find a picture of a cup of tea in one of her beautifully hand painted cup. I could be in the middle of a desert and still crave for a cup of tea. Yes, it is that bad (or good)! My friends are all (mostly) avid tea drinkers. Each one of them makes it their own way. Ginger tea, black tea, black tea with sugar and a wee bit of cream, black tea with just cream, black tea with just sugar, black tea with nothing, darjeeling tea, assam tea, masala chai, earl gray, green tea, white tea, orange pekoe and a vanilla infused tea that someone at my work steeps often. Some drink it right off the pot, some drink it after it has turned stone cold, some will warm up the tea pot before pouring tea in it and some are particular about their china. It is absolute madness over just a cup of tea. So much fuss over a cup of tea you may say, but you have to love something as much to know why. And then, tea is heart healthy. I think more than the tea itself, the conversation that happens parallel to it, lightens up every artery in your heart. Those blockages are not just caused by eating junk or lack of exercising. They are caused by keeping things to yourself and piling it within you. Instead, share it with someone over a cuppa. It will make you feel a whole lot better.